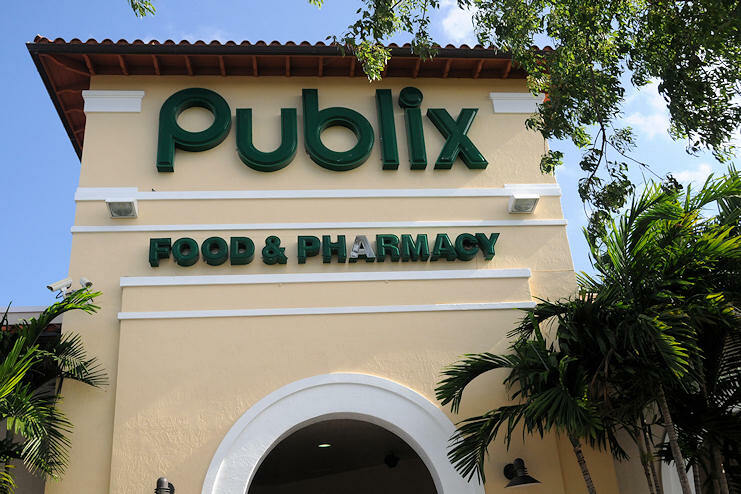 If you want to buy groceries in South Florida, you’re pretty much stuck with the Publix supermarket chain. It’s not technically a monopoly, but it comes pretty close. Publix’s only real competitor is Winn-Dixie, but even though there are a couple of dozen W-D outlets in South Florida, somehow I never seem to see them, while Publix is literally everywhere. The thing about Publix is: It’s not really good, it’s not really bad, it’s just meh. I’d love to know the story on how they came to dominate the grocery market, because it can’t be because of the quality of the stores—unless maybe the competition was worse. Of course, some Publix stores are better than others. As is so often the case, the more affluent the neighborhood, the better the quality in the local supermarket—at least up to a point. I tend to judge supermarkets by the produce department, and this is where I really think Publix falls short. Again, it’s not that it’s really lousy. It’s just so damn mediocre. You would think that this is an area where the dominant grocery chain in Florida would shine, since this is where so much of the vegetables for the entire US eastern seaboard are grown, especially in the winter. But the produce in Publix looks no better and often worse that what you would find in a typical supermarket in the northeast, and the prices are just as high if not higher. Compare Publix to any decent supermarket in California, and you would see the difference. Or even Texas, for that matter, where the local HEB chain has really raised the quality bar for groceries. When I was in San Antonio recently I was amazed by the quality of the produce in the HEB stores as well as the low prices, which were often half of what I was used to paying in Florida or DC. HEB’s gourmet stores called “Central Market” are incredibly good; they make Whole Foods (another Texas-based company) look like, well…, Publix by comparison. Since there’s essentially no competition, Publix can get by with a gentleman’s C, and the public has nowhere else to go. Well, that’s not entirely true, since there are a handful of Whole Foods markets in Broward and Miami-Dade, but chances are you’ll have to drive quite some distance to get to them. There are also a few Fresh Markets scattered about that cater to customers who care about better food. Even Publix is trying to get into the high-end grocery market with its GreenWise Market stores, but so far there are only three of them, and the closest is in Boca Raton. You can also try farmers’ markets for locally-grown food—though the season for them is coming to an end. And there are the mass-market megachains like Walmart, Target, and Costco that offer limited selections of vegetables and meat in addition to packaged food with long shelf lives. But when you just need to run to the grocery store, you’ll probably wind up in a Publix because it’s there. Maybe they should change their motto from “Where shopping’s a pleasure” to “Resistance is futile”. I think you have this exactly right. I think you’ll also discover that the mediocrity you observe at Publix is mirrored at many other Florida institutions, agencies, activities, etc., and probably for similar reasons having to do with the strange transient population and its wide but shallow diversity of cultures and backgrounds. Because no single group dominates, there are attempts to find a mean, a compromise. Nice marketing is unprofitable, so to maximize outreach, the edges are lopped off and the bland dominates. Radio is another excellent example. It puts the Meh in Mehdia. Where shopping is employee owned. You are clearly an UN-informed consumer with a bone to pick. How the hell did you miss Wal-fart as its BIGGEST competitor. (no that was NOT a typo in their name) and……THEY however pretty much CAN me called a monopoly, or just may be soon enough with all the low-brow shoppers flocking to them. Hmmmmmm, maybe YOU work for Wal-fart. Ok, I’ll give you the produce thing, not always the greatest. Whoa there, Billie! I have a bone to pick? Actually, I did mention Walmart, if only in passing, and you have a point in that they have become a major competitor to traditional grocery chains. However, Walmart stores are not everywhere–even if it seems like it. They are usually in outer suburban areas or small towns. There is none (yet) in the City of Miami or Fort Lauderdale or Miami Beach, which I consider a good thing. Walmart is the commercial equivalent of a neutron bomb for small town America–killing off the existing businesses and leaving the buildings standing and empty. Which is why most central cities have resisted attempts by Walmart to put stores there. After 18 years in the city of Dallas, one of my best finds in St Petersburg Florida was Publix supermarkets. where did you get the idea that they couldn’t buy their produce locally? I have a Publix four blocks from me, and that’s of their big selling points. Locally grown producer. A couple of years ago, they closed that store, tore it down and built a new super Publix. Its great! Better than anything I was ever offered in Dallas. Butcher shop with quality meats that are cut to order.Unparalleled customer service due to being employee owned. BTW, sorry that Miami is so Wal-mart challenged. Without leaving my street, I can go south less than a mile to a regular Walmart, with a super Walmart about 3 miles past that. To the north, I can walk about 3 minutes to a Sam’s Club. Five miles past there is a Walmart Neighborhood Market. Just 3/4 of a mile past that is the country’s highest grossing Super Walmart! I buy as much as I possibly can from the company. They employ far more people than any of the places that they put out of business. Best of all – they’re non-union!!! Having lived in both states, please tell me what “supermarket” in California you get great produce without paying an arm and a leg? I think you’re comparing apples to oranges. Publix is a true supermarket, where as a lot of cali stores might have a brand name, but are locally run. As for pricing, I found anything in cali, especially fish way overpriced… sure oranges are cheap in cali, but who wants cali oranges? I suggest you drive around and look, you will find a small market where only Cuban is spoken and find a treasure trove of fresh local produce. Publix became a monopoly in Florida, few years ago there were Winn-Dixie, Albertson, Sav-a-Lot, Sweetbay – , now there is only Publix. Every new plaza open in South Florida, you can bet it will have a Publix store. I do not know how they survive or what’s good about the store. I know people shop there because they have no choice, not because they like the selection, the prices, or the service they receive. Publix DOES NOT support local economy and local farmers, they DO NOT purchase local produce. We live in the area surrounded by farm stores with excellent produce and reasonable prices, Publix imports terrible fruits and vegies from South America and Asia and sell them 4 times the prices of local farmers. We live on the Oceanfront, the same fish you can catch from any pier, you can buy at the store for $22 a pound. Face of the American greed should be Publix’s slogan. There are laws against the monopoly and I hope someone will use them against Publix. I’ve been to a lot of supermarkets in my life — throughout the USA. The best have decidedly been Publix, Wegman’s and Kroger.